The sun-filled ensemble room resounds with the music of the violin virtuoso as well as the next generation of lead guitarists. Budding filmmakers and actors work with accomplished film actors and directors in the annual film festival. Student sculpture, pottery, and paintings abound, many rich with global themes. 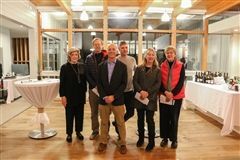 The arts at Indian Mountain School inspire students to bring creativity, passion, vision, and a sense of wonder and possibility to everything they do. The arts are an essential part of every student’s course of study. A stellar faculty of gifted artists and performers guides students in exploring new themes and developing their own creative passions. While the atmosphere is intentionally filled with levity and fun, productivity and expressiveness are both encouraged and expected. Strong, highly individualized programs in film, drama, studio arts, and music foster the spirit of imagination. As students find their voice and their vision, they gain the confidence to embrace new experiences in any field. Many graduates have discovered a lifelong passion and gone on to advanced study and careers in the arts. Visit the Lower School section to learn more about music, art, and performance opportunities in our younger grades. Eighth grader Hansi Zhu recently created the stunning backdrop for our 17th annual By Kids For Kids benefit concert, which raised more than $1076.00 for the Hole in the Wall Gang Camp. The annual IMS Art Show was the most successful contest to date and the work is now on display in the Student Center. 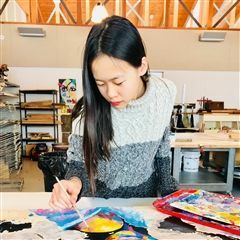 Eighth grader Julia Zhang recently received a Silver Key Award for her painting, “My Homework,” in a competitive, statewide student art competition.